Welcome to the PanPastel Week with StencilGirl! One of my favorite things to do with PanPastels is to try different mediums with them. 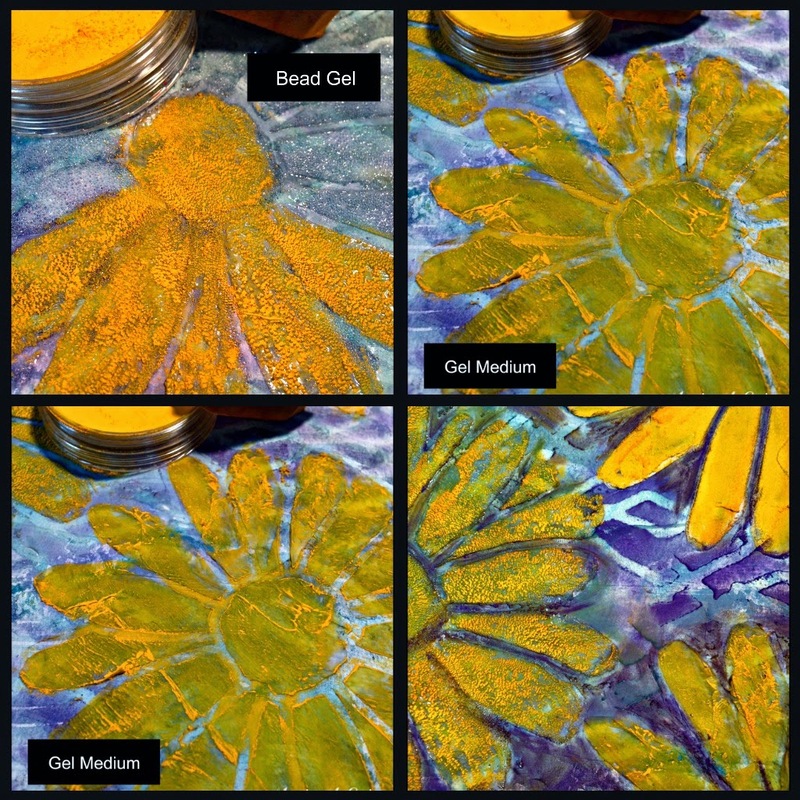 Today, I decided to use a variety of Golden Products to try in my Art Journal with StencilGirl stencils and PanPastels. For the background I used Golden Acrylic Ground for Pastels. Using a old card, I swiped the page with the Ground and let dry. They using a Sofft Sponge, I put some color down on the page with PanPastels. As you can see from the photo below, the color is more intense where I had more medium. Then I laid the Diamond Waves stencil on top and used another PanPastel color. The result--a fun background to start with. 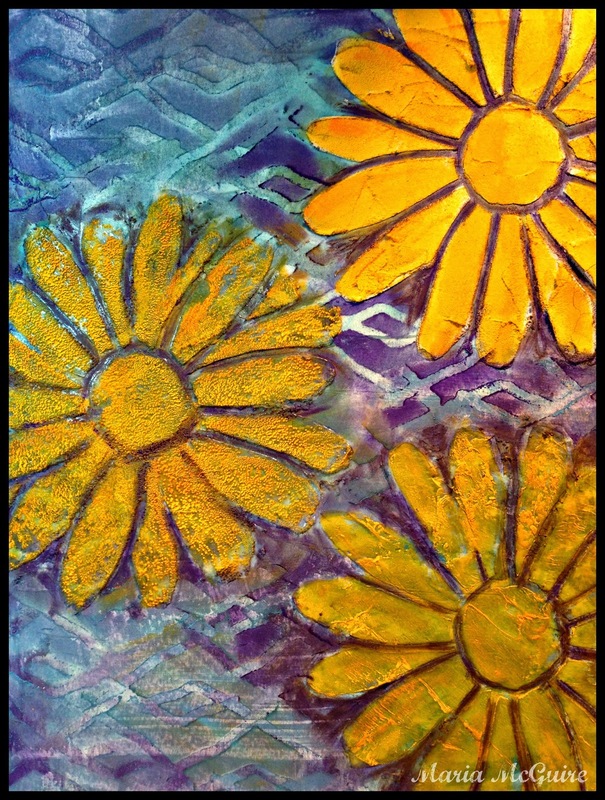 Next, I used the Doodle It Daisy stencils with a variety of Golden mediums--Glass Bead Gel, Crackle Paste and Regular Gel Medium. Each was spread through the Doodle It Daisy stencil. The last photo show the page when the mediums were dry. Below you can see how each medium looks when lightly swiped with a Sofft Sponge and PanPastel. Experiments like this let me keep a record of how different products react so I can keep this page for reference for future products. for letting us play with their products! Make sure you stop by Carolyn's blog to see her VIDEO today, but before you leave make sure you post a comment below to be entered into the GIVEAWAY on StencilGirl Talk. We know after you see all the techniques we show you this week you are going to want to play too! Enter the GIVEAWAY to be eligible to win the prize below. Just leave a comment and tell us if you use PanPastels with stencils and your favorite technique. You can also leave comments on all of the individual posts this week on all the blogs from our team members for another chance to win! All comments within the 4 day period are eligible. GIVEAWAY closes Sunday, August 3rd @ 11:59PM Central Time. Thanks for sharing your experiments. I have never tried the Acrylic ground for pastels; something to expereince for me. I particularly love the bead gel effect. Thanks for this, Maria. It is really interesting to see how the PanPastels react to the media. You ended with a lovely page! That bead gel is my favorite, I didn't really see the crackle effect from that crackle medium. But sometimes pictures don't do it justice. Great pictorial, outcome with awesome. LOVE the fact that Pan Pastels can be used with other mediums.....and the colour range is fabulous. Your use of bead gel is perfect for the subject...a lovely image. What fun! Thanks for the post! Very nice, Maria! Those pan pastels really bring out the texture of the bead gel,don't they? Just one more medium I must have for my supply shelf…and truth be known, I didn't want another medium as I have a bazillion already, but I DON"T have the pan pastels, and they are so pigmented, easy to use and versatile - my resistance is certainly crumbling under all the inspiration presented in this blog hop….so they will very soon go from my wish list to my supply box. Thank you for such inspiration! This is beautiful! I do not have any pan pastels or glass bead gel. They will certainly go on my wish list! What fun I would have experimenting! Thank you for sharing you talent and the chance to win. Maria! How cool is that! 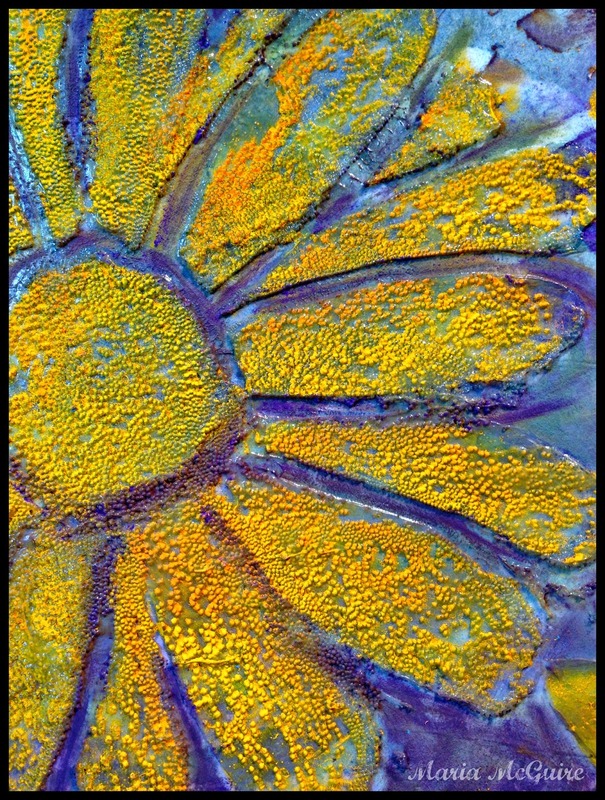 I love how you experimented with the PanPastels and the bead gel medium- sooo inspiring! Thank you! 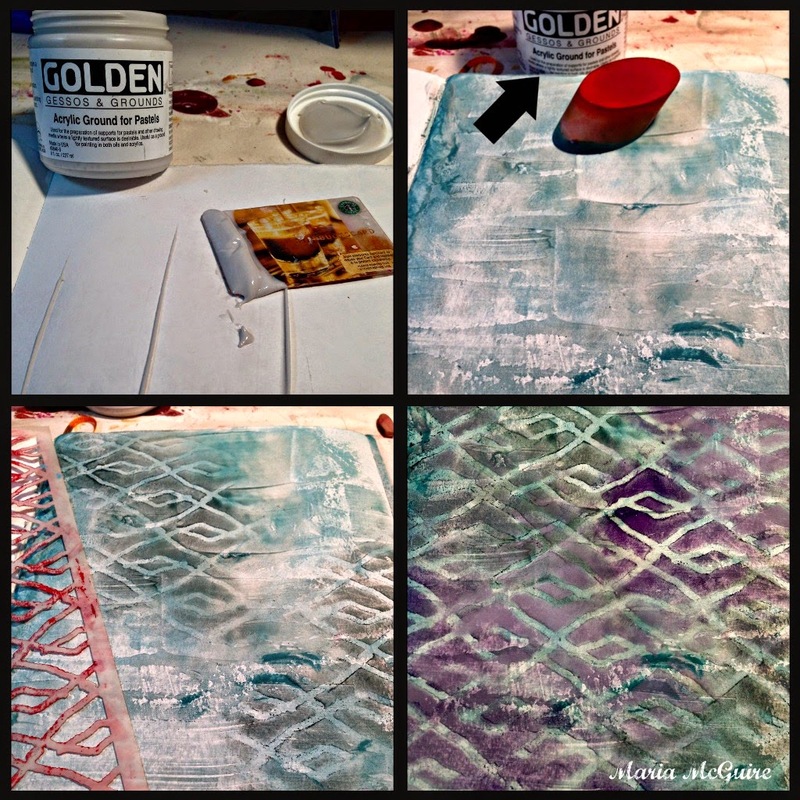 Love this post, Maria...the way you showed us how 4 different Golden media interact with PanPastels! Now I want to try them all!! Love it. I never would have thought to use pan pastels that way. So cool. Love the effect with the bead gel! It looks like pollen on the flower. Thanks for the chance to win! Thanks for showing the difference between how the Pan Pastels adhere to the different media. What a great demo. Very lovely. Love Pan Pastels. Loved seeing how the Pan Pastels react with the different medium! Thanks! I have to buy the acrylic ground, but now I know what to do with that bead gel! the petals on the sunflower look like you could brush them and the pollen would come off onto our fingers. Beautiful. thanks for sharing your knowledge. You've given me the push to get my pastels out and start creating. Maria, so beautiful. Wow there are so many options...I want to try them all. 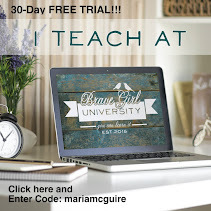 Love your tutorial, Maria! 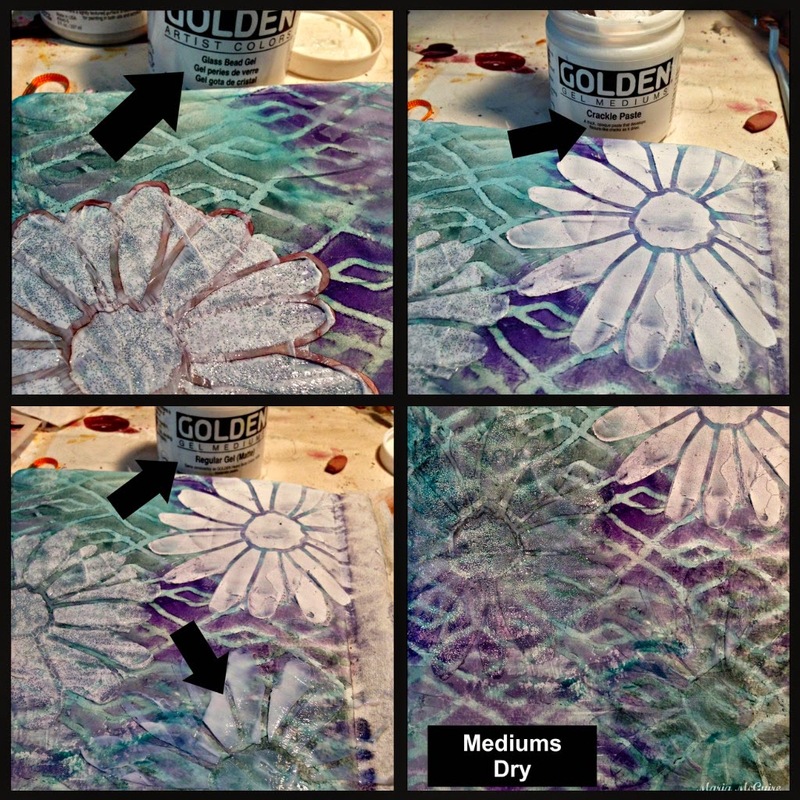 Love the SG stencils and Pan Pastels you used and the texture you created! I haven't tried Pan Pastels yet...but am enjoying the giveaway posts! Oh boy do I love this one! Especially the texture from the beaded medium. I have never used it but this makes me want to try it. great work. Looks like some pastel medium is in my future wish list. I love, love, love this page! All those amazing mediums coupled with the pastels is a FABULOUS page! Thanks so much for sharing!!!! Wow, that taught me so much, what a great idea to make a project to refer back to on how mediums react with the PanPastels. Favorite was glass bead gel medium for the flowers. Want to try the PanPastels with StencilGirl's stencil and love the way different mediums change the look. I give thanks to you for all the hard work & knowlege you shared. Thanks! Stunning page, Maria! I love the colors and their intensity. I gotta tell you that the daisy with the bead gel really rocks it for me! Glad to know you like to experiment too. Thanks! This is beautiful Maria! What a great idea to use them in conjunction with different mediums on one page. It is so interesting to see how they react and look so different with each one. Thank you for sharing! I love this daisy! and the way you used it. thanks for sharing. I so want to be able to play with the pan pastels. Great suggestion on keeping track of your experiments with different mediums and the magic of PanPastels! Wow, I fell in love with all those textures. And the colors are so very intense, too. I apologize, but I have removed my e-mail from my blog because it sends out spam. If I should win, please contact me on my blog, please. Maria it's fabulous, the way you show the different results of mediums with pan pastels, thanks for sharing it with us! What a great combination...an experiment that is informative while being creative, colorful and very cool. I really like the texture of the crackle paste,even though it looks like it didn't crackle. The glass beads are fun too. Thanks so much for sharing. Cool way to use the mediums. I liked the glass bead look the best. How cool are these panpastels??!!!! Just love them. love the look of the pan pastels. thanks as always for sharing. These are beautiful, Maria! My favorite is the one with the beads gel. Wow! I've never used pan pastels but I would love to give them a try! Thanks for showing your fun technique! I love the vibrant yellow of the flowers! I like the glass bead gel technique the best. Beautiful texture and colors! I love this work you have done. As this week goes on, I am more and more excited about using pan pastels and stencils. Now I have more ideas for using acrylic mediums. Maria, this is gorgeous! Thank you for the opportunity to win!!! What great ideas. I need some more pan pastels for sure! Wow...have never tried pan pastels...oh dear..I'm in trouble...especially after seeing all the lovely ways to use them!! Thank you for sharing your Panpastel experiment with us today. I love how the glass bead gel turned out! Very nice background! thank you. Wow!! Beautiful. I love all the texture differences. Thank you! Still the best art teacher ever! Love the beaded appearence. What great texture. I have just purchase and used pan pastels for the first time. I used it to create a colorful background. I love my pan pastels, great page! Awesome effects from the different mediums & the Pan Pastels! Each post & idea makes me want those Pan Pastels more & more! This page is so wonderful! Love the colors and the textures! Love how it really popped with the crackle medium. Thanks for showing us the different mediums to use with the pan pastels and stencils. This hop has been fabulous! What great info. I have been debating about buying pan pastels .... now I am sure I will be doing so very quickly. Love how different they show depending on the medium used. OH..I DIDNT KNOW WHAT TO DO WITH THEM... NOW I DO..I MUST HAVE THEM ALL.... THANKS SO MUCH. I TRUELY ENJOYED THIS!!!!!! Just beautiful! I'm getting out my Pan Pastels and playing! I love how you experimented with different mediums. Thanks for sharing. I have to say, I don't own any Pan Pastels but they sure look like fun to play with. I love the different outcomes you got using them. Love the stencils also. Thank you so much for sharing this technique with everyone. Love the effect on the glass bead gel. Fabulous! I never would have thought of that. You rock, Maria! This is a new perspective of pan pastels, thanks! I love your techniques and can't wait to try them out. I have used pan pastels a few times but only as part of mixed media. Practice makes Perfect !! I have some of the Golden products you used,so now just need to find my Pan Pastels and give this a try.Thank you for the art lesson and the giveaway. Be still my daisy. Loving the snap crackle and pop. Wow, that is really cool! Thanks for sharing! Loved this video! I am learning so much. I'm new to Pan Pastels as well as using the acrylic ground and the glass bead gel. 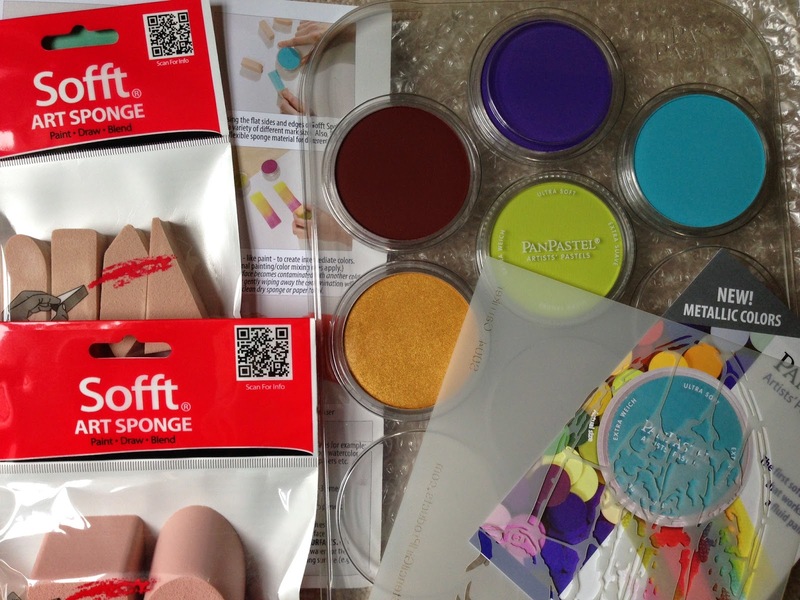 I can't wait to try my hand with these different textural mediums! 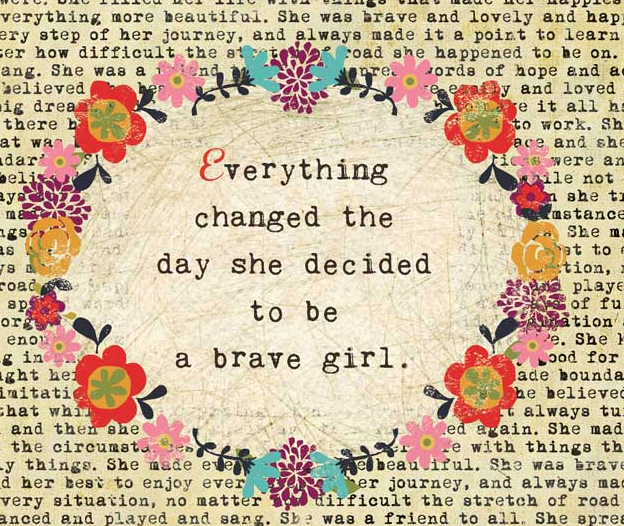 Oh my goodness, I love this! Awesome effects with the different mediums, love seeing how they all work with the PanPastels! And how on earth have I never thought to use that glass bead gel with a stencil... the texture you got on that is amazing... especially with the color on top! This is so cool. And I just love how it all looks together! Love what the glass beads do but also love how it ended up. Daisies are one of my favorite flowers - and I have hundreds of favorite flowers - LOL. The flowers look so good and they really pop against the diamond wave background colors. Thanks for sharing! Can't wait to try the pan pastels!! I love how the flower glows! These look wonderful. I do not have any and would love to win to give me a chance to play with this product. So neat to see the results of the different mediums used. I haven't used pan pastels yet, but I'm looking forward to lots of fun playing with them. Thanks for the chance to win these. Great tutorial, Maria! Thanks for showing how each medium looks and interacts with the pan pastels. I really like the bead gel. I haven't used pan pastels YET, but how can I not play with them after a full week of inspiration?! Thanks for the chance to win! This is an awesome way to come up with an exciting & new (at least to me) way of working with these delightful pan pastels!! Just beautiful!! Thanks Maria! I look forward to trying pan pastels very soon!! Beautiful background! Love the flower idea too. Great way to show us these different effects too. Thanks for sharing. Never used Pan Pastels. Would really like to win a set to play with. thank you for showing this how to on pan pastels! Exciting new techniques. Love pan pastels, but only have a few. I've never tried pan pastels but would love to. Thanks for the giveaway. Super wow and "how cool is that!" It's amazing the different medium effects ;) I've had a jar of bead gel sitting for 7-8 months unopened and believe me, stencils, pan pastels, and glass bead gel are on the top of the play list! Love the effect of the bead gel! Just love the way you worked with the Pan Pastels! I never have tried them with a stencil and it looks like so much fun! I absolutely love the end result! Great techniques. WOW!! Loved learning about using the other Golden Products with pan pastels....how cool was the bead gel....thanks so much! thanks for the ideas, when I have some product I will give them a try. I especially love the Pastel on top of the glass bead, I would *never* have thought of that. Fantastic. Now they could focus on acquiring simply a few top quality and good review rather than contending with various other brands for" likes". buy 5 star facebook reviews The firms could now concentrate a lot more on the top quality of their field instead of the number of fans.